I have been making an effort to read more lately and, oops! it seems I gravitate towards food-related books *shrug emoji*. 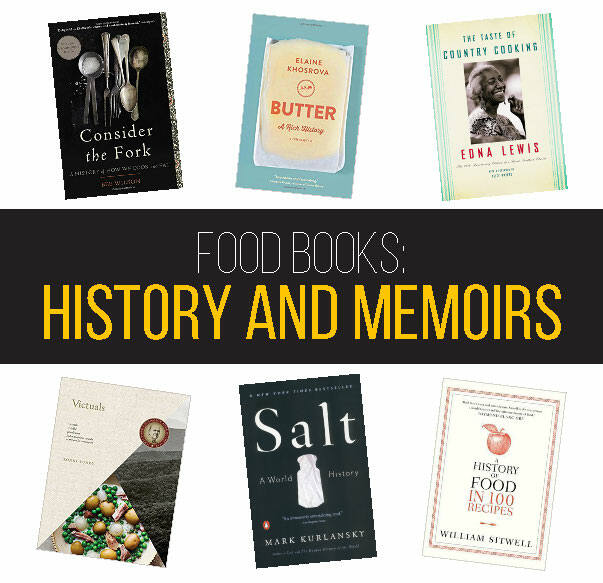 And in that realm of food-related books, I seem to be on a streak of food history books. I can't get enough of them! There is SO MUCH TO LEARN YOU GUYS. Here are some I've read recently (fyi the images are affiliate links, let's see how this turns out...). While reading this book, I amazed co-workers and friends pretty much on the daily with fun facts about salt. "Did you know Roman Soldiers were paid with salt and that's where the term 'soldiers' comes from and also the term 'salary?!?'" I'm sure they loved this daily info and were not annoyed at all, especially my regular interjection of "SALT IS SO IMPORTANT YOU GUYS." But it is! So important! To life (we need it to live) and to history and to flavor. This book is a fun and super-interesting read. You will never take salt with a grain of salt again. I mean. Who doesn't want to be immersed in the world of butter? Oh, you want to be immersed in actual butter? Samesies... but this book is the next best thing. What a fascinating ingredient with, as the title says, a rich history. The author travels all over the world to learn about the simple, yet beloved and essential ingredient. From utilitarian preserved butter from before refrigeration, that required so much salt that cooks had to rinse it well before using, to modern artisan butters with a dazzling array of variations. The book has given me aspirations to seek out and try more butters. Also included are "essential" recipes that butter plays a starring role in. And you have got to love the appendix with the word "butter" listed in over 50 languages. Dreamy! I kind of read cookbook as if they were books, anyway, so this book seemed like a natural. It is filled with compelling and charming historical tidbits, though mostly about British foods. I would have loved to see more Eastern representation, but I suppose that would take several volumes and way more than 100 recipes. Not every chapter was riveting, but they are all short, so it's overall an easy and fun little read. In college I did a research paper on the history of eating utensils. This book is more than that, it's a history of food culture and appliances and the evolution of the kitchen, as well as utensils. Another book that is heavily Western, but more in-depth than "100 recipes." This book did make me want to hit the nearest antique mall and look for various old-fangled cooking implements like egg beaters and spit-jacks. What's just as interesting as where and how so many of our familiar kitchens came to be, is how long innovation can take. Some of that is fear... gas stoves and microwaves and refrigerators all sparked safety concerns... but also the fact that some things just work so well that no one is clamoring to try and make them better. For instance, pots, whisks, mortars and pestles... those all do the jobs better than anything modern inventors have come up with so far. And, they just feel good to use, you know? This book made me feel nostalgic, enlightened, inspired and curious. Part memoir, part cookbook, part history book, part interview book, Victuals (pronounced "viddles"... so that's how you spell it!) is illuminative and charming. The author, Ronni Lundi, talks about her childhood in Kentucky, reminiscing about her family and ancestors. She also spends time with current chefs and producers in parts of Appalachia, simultaneously finding out about their roots and motivations, and getting delightful recipes. She talks a lot about foraged ingredients, too... ramps and wild greens. Makes one want to rent a cabin near Asheville and roam the mountainside for dinner. This is a classic cookbook that I regret not knowing about sooner. It is broken up by season, because that's the way people used to cook. Crazy, huh? If you do nothing else, read up on Edna Lewis. What an inspiriting person! Written in 1976, The Taste of Country Cooking somehow manages to be ahead of it's time, while remembering how things used to be. Maybe that's just me, a Midwestern suburban girl raised on hamburger helper and taco kits, scratch cooking reserved for company or special occasions. I was transported to another time and place, but it also feels very now, and very very accessible. Between Victuals and this book, which I read back to back, I am left with aspirations of living a more simplified, seasonal, cozy life. With more caramel pies.